Subject: PSPP should remove the scary, misleading message about "UNRELEASED	TEST SOFTWARE! NOT FOR PRODUCTION USE!" The message added to the top of all PSPP windows was: "UNRELEASED TEST SOFTWARE! NOT FOR PRODUCTION USE!" I think that's too loud, too scary, and too cryptic and I suggest that it be removed. When I started typing this note, I was going to offer a better message, but I think the best course is to remove this string. First, it makes no sense that it's IN ALL CAPS or uses a BANG! I think most users associate ALL CAPS with SHOUTING and PSPP shouldn't be shouting at it's users. It's also too cryptic and too scary--most desktop users don't know what "production use" is and they seem to read "UNRELEASED TEST SOFTWARE!" as meaning something like "DO NOT ENTER!" or "ROAD CLOSED!" (or "F**K OFF!"). I think a legal mind might argue that GPL software cannot add terms like "UNRELEASED TEST SOFTWARE! NOT FOR PRODUCTION USE!" to the GPL (or, that's it is unwise). The message is certainly antithetical to a common FLOSS mantra of "release early, release often" to warn users not to use a "test" version. It also implies (falsely) that there will, someday, be a "released" and "tested" version of the software that IS "for production use" but that's not true. For windows users, will never (ever) be a released version and the GPL specifically disclaims any "use" so there will literally never be a version of GPL software that is suitable "for production use." but that won't fit on the title bar. You could put something like "Test version 0.9.0-g636302; please report bugs at http://savannah.gnu.org/bugs/?func=additem&group=pspp" (if it's feasible to insert the version number into the string) and that would at least alert the user that the software might have bugs and tell them where to report bugs. I wouldn't put "beta" or "alpha" in the string, because both of them are potentially misleading (beta implies an alpha, alpha implies a beta; neither would be true). 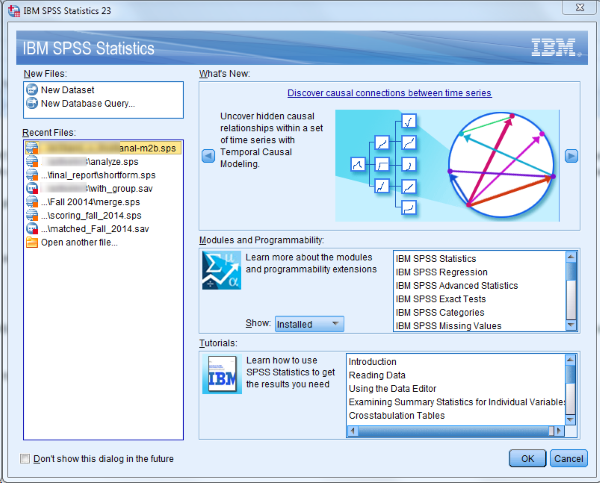 PSPP may not wish to mirror SPSS too closely but for a long time now SPSS starts with a window (see below). If PSPPIRE also showed a dialog at start, there would be more room for a proper message about the software, news from PSPP, recent files, etc. Note that the dialog has a "Don't show this dialog in the future" checkbox, so users could make it go away. I don't think this dialog is needed, but it would be an opportunity to adhere more closely to GNU advice about alerting users to the GPL which already covers this ground. Maybe it's simpler to always print something like the GNU advice to the Output window upon start-up?